Time: 12 October 2018, 7 p.m. There is future in the past and hope in the young. 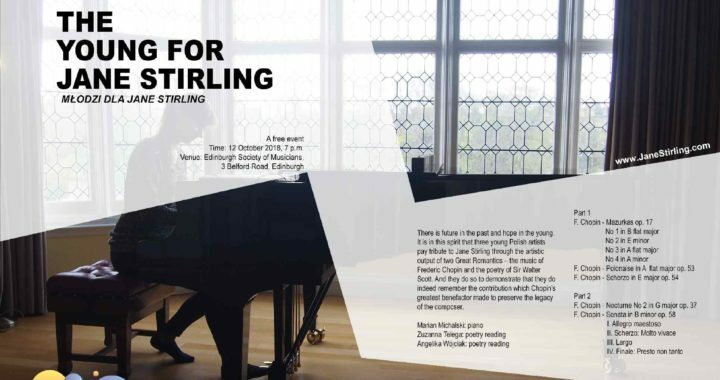 It is in this spirit that three young Polish artists pay tribute to Jane Stirling through the artistic output of two Great Romantics – the music of Frederic Chopin and the poetry of Sir Walter Scott. And they do so to demonstrate that they do indeed remember the contribution which Chopin’s greatest benefactor made to preserve the legacy of the composer.